After devoting much of the week to observing Ceres, Dawn will execute a pair of burns with its ion engine today to modify its orbit. Starting a little after 1:00 PM, the ship will thrust for less than two hours, wait about six hours as it continues to revolve around Ceres and then thrust again for less than two hours, finishing around 11:00 PM. With its uniquely efficient and gentle ion engine, these small orbit maintenance maneuvers will keep the explorers' orbital motion aligned with the plan the flight team has devised for systematically studying the alien world from this low orbital altitude of 240 miles (385 kilometers). Dawn will spend most of the weekend sending its pictures and other data to Earth. When it has finished on the morning of Jan. 10, it will begin collecting still more data. It has 10 or more short explanations that pop up if you hover over parts of the picture or click on the picture's various written labels. You can learn which chemical elements in the surface material Dawn is now gauging the abundance of. Dawn is scheduled to conclude ion-thrusting for its spiral descent shortly before noon today. At that time, it will be orbiting about 240 miles (385 kilometers) above Ceres, closer than the International Space Station is to Earth. After it turns to point its main antenna to Earth, navigators will begin to measure its orbital parameters very accurately. During the next two days, they will analyze the orbit carefully and decide on Dec. 9 whether to make an adjustment at the end of the week. (It is likely such a trajectory correction maneuver will be needed.) The November Dawn Journal explains this in more details. The October Dawn Journal is out. Ceres was the subject of a session at the American Astronomical Society--Division for Planetary Sciences (DPS) meetings in Washington DC area 8-13 November. Dawn's altitude is now less than 800 km (500 miles). It is descending to final orbit LAMO altitude 375 km. Dawn has reached HAMO (its next-to-closest orbit) and started photography and sensor work around 10PM pacific time on 17 August. This phase lasts a bit over 2 months and will involve some 80 passes over the day side of Ceres from N to S pole. LAMO, its *really* close final orbit, will not be reached unti mid-December. That's the orbit where Dawn will be able to detect the chemical elements in surface material (to a depth of about one meter) by their gammaray emission and neutron scattering. An anomaly developed on 30 June and Dawn's descent from 4400 km to 1450 km altitude orbit did not start as planned. The craft was reconfigured and a successful test was performed around 15 July. Results were evaluated around 16 July. I only have estimates, no official report yet. The craft now seems to have resumed descent. DSN is no longer communicating. Simview shows the thruster is on. they may have changed thrusters, they had at least one usable backup unit. I found the YouTube visually interesting and informative. It is for a wide audience--covers all it can, once over lightly--and as such is well done. It's height is estimated at 5 km. Other mountains are showing up in the latest shots, most clearly when you get the arc of horizon in the picture. Check out the new version of simulated view. Dawn is shown orbiting a globe with its own photos of Ceres projected onto it. The current simview (19:59 UTC 2 June) shows the double bright spot. But what we see rotates, so other recognizable features will appear and those "headlights" will disappear in the next few hours. Dawn retro-thrusting so as to spiral in closer. 23 May picture shows higher resolution, smaller pixel size. Horizontal scratches seem roughly aligned with Ceres rotation. East-West. Photo taken from about 5000 km. Planned descent to altitude 4400 km orbit. Am still in the "RC3" orbit, 8,400 miles (13,500 kilometers) from #Ceres. Update: I began science operations on Friday night and spent the weekend collecting science data at #Ceres. Here's an animation of pictures shot around 15 April from over Ceres N pole: Click on the image to get a coherent version. If all goes as planned, Dawn will have slipped into circular orbit by 23 April. Target orbit radius is 14 kkm and the probe is now at 14.3 kkm so only about 300 km closer in to go, and a few m/s slower. To hold the target orbit, looping over N and S poles, speed must be 67 m/s and present speed is 72. So almost all the thrust vector is now aimed at slowing down. The first circular orbit will be at an altitude of 13.5 kkm or a radius of about 14 kkm which is the distance at which the Ceres disk will fill the full view frame of Dawn's camera. Any closer and we will not see the whole disk. Dawn has rotated around to point its thruster tail at Ceres, so as to slow down. So it won't arrive too fast to curve into circular orbit. Approach is a tricky navigation thing. They will soon take a picture of Ceres against the background of known stars, for navigation purposes. Only a tiny crescent is illuminated because Dawn is approaching from the dark side. Old post: In the current status (12 March) view of Ceres from Dawn's perspective, Ceres covers one of the stars in Orion;s belt. the Sun, not shown, is about 20 degrees up and to the left of Orion's belt, outside the view frame. Dawn arrived with excess speed which has carried it past Ceres. This one-minute video shows the plan to cope with this. It has distance maxing out between 15 and 20 March after which the spacecraft swoops back in and winds into a circular orbit. You can see how the ion thruster is used to slow the probe's speed and shape its orbit. The image of Ceres is exaggerated over-large and its rotation is far from realistic---but that's just details, the main thing is to show the trajectory. Current status (12 March) shows the probe's distance from Ceres to be over 73 thousand kilometers. Comparing that with the projections in our table I have concluded that Dawn will not make the turnaround as soon as originally expected. It will overshoot the 77 kkm turnaround goal. "Confirmed: I am in orbit around #Ceres"
Dawn Journal (DJ) is really informative. E.g. from November 2014 DJ one learns that the spacecraft is approaching from sunward direction, so sees a fully illuminated face, a "full-Ceres". Ceres equatorial diameter is 950 km. So radius is 475 km. A formula for angular size (how big it looks in the sky, from the probe's distance R) is "2arcsin(475 km/R) in degrees"
You just plug in the current distance for R and paste that into google. Back in September some electronics were disabled by a cosmic ray particle and the craft lost several days of thrusting until they managed to revive it. this was a cliff-hanger and is described in October 2014 DJ. There are two diagrams, one looking down on Ceres north pole, one looking in direction of orbital motion. the new trajectory uses Ceres gravity to assist in making up lost orbital speed. It's interesting, might be worth a look. If all works out, they plan to first get into a polar orbit at altitude 13,500 km above the surface, then if that is successful, spiral down to around 4400 km altitude, then around 1400 km, and finally around 375 km. Both Dawn and Ceres are orbiting the sun at a bit over 17 km per second, roughly neck and neck with Dawn trailing just slightly behind and since 24 February beginning to catch up. Excess outwards and upwards speed is being reduced by both the crafts own thrust and Ceres gravity. Ceres axial tilt is only about 3 degrees which is small compared with Earth (23 degrees). It's north pole direction points almost straight up from its orbital plane. nearly perpendicular. So the sun direction is always pretty nearly directly overhead at Ceres equator. Actually now it is right around southern hemisphere summer solstice with the north pole direction leaning slightly away, but that 3 degrees hardly matters. Dawn is still slightly below Ceres equator and is gradually coming up north as it approaches. The goal is to get into a circular POLAR orbit that passes over both the N and S poles. The first polar orbit (called RC3) will be altitude 13500 km, which means orbit RADIUS 13975 (have to add planet radius 475 km to the altitude above surface). In both diagrams the sun is straight off to the left, and Dawn is approaching from that direction. The upper diagram has Ceres orbit direction straight into page. Both probe and planet are going very fast (over 17 km/s) in that direction and that motion is not shown in diagram. What is shown is the gradual sideways "sidling up" of the probe to Ceres. Projected onto a plane that is normal (perpendicular) to ceres orbital direction. The lower diagram shows Dawn's approach trajectory projected down onto Ceres orbital plane. Ceres orbit motion is from bottom to top edge of frame, sun as usual is off to left. You can see that the probe has not quite matched speed so it falls behind a little as it approaches. By 24 Feb it will be trailing Ceres by about 28,000 km, and it will also be about 28,000 km above Ceres orbit plane (as the upper diagram shows). Around 24 Feb, as lower diagram shows, the pull of Ceres gravity stops it falling back and begins to make it catch up so that it trails by less and less thereafter. This diagram from the November 2014 DJ shows the EARLIER PLANNED approach trajectory which would have worked if the thruster had not been temporarily out of commission in September 2014. then probe would have been completely up to speed and would not be falling slightly behind as it is now. So the earlier arrival was much more direct. What they have added is a time-consuming gravity assist maneuver, using Ceres pull to help the probe catch up. March 6 has been marked "capture" which is the technically defined moment when probe's velocity is less than the "escape velocity" at that distance. So it would need a boost to get loose. After "capture" Dawn could theoretically turn off its thrust and do nothing and from then on it would be in SOME kind of (possibly weird shaped elongated) orbit around Ceres. But after the technical moment of capture it keeps on thrusting (sideways backwards, whatever works) in order to SHAPE its orbit into one convenient for studying the planet. The rest of this post is unedited and repeats what I just said. Sorry about the repetition. In this picture, Ceres orbit velocity is directly into the frame and the sun is way off to the left. So Dawn is approaching from the left The circles divide the approach up by days. They are "day circles" marking the days until capture, which happens about 6 March. Of course Dawn is also moving with Ceres into the frame at almost the same orbit speed of around 17 km/s, not shown because straight into frame. As a detail. Dawn is orbiting just slightly slower so it will be lagging slightly behind (which is up out of the plane of the diagram) for a while until Ceres gravity has pulled it along some and it is back in the plane of the diagram in circular orbit. this is a critical stage. I feel a bit in suspense about the "gravity assist" part of this approach maneuver. We are following the green curve. If you count the day circles until capture on 6 March you'll see there are 18 days. So Dawn enters at the left edge of the frame on about Valentines's day 14 Feb. that is about 18 days before 6 March. Capture will be when Dawn has enough combined nearness and slowness to be trapped into orbit. So it won't just sail on past in a fly-by. Something, its ion thruster, has to get it near enough and slow enough to be caught by the mini planet's gravity. The initial orbit is highly elongated and as soon as it is in that elongated orbit the thruster will be used to RESHAPE the orbit into a CIRCULAR one that passes over the N and S poles of Ceres. Polar orbits are good for observation and mapping, because due to the planet rotating on its axis sooner or later you get to see every part. you are looking down on every longitude and latitude at one time or another. That target circular orbit RC3 is at altitude 13500 km above surface and the nominal diameter is 950 km, so radius 475 km. So orbit radius nearly 14000 km. Let's call it that for round numbers. Escape velocity from surface is said to be 500 m/s so circular orbit speed AT surface would be that divided by squareroot 2. 374*(475/14000)^.5 meters per second, times the number of seconds in a day which I guess is 86400. That's 68.9 meters per second, and it comes to 5952 km per day. So let's look at the day circles distributed along the circular "RC3" orbit in the diagram and see if that makes sense. Faradave and Laughsocks, here's something nice I wasn't expecting! Three posts back, the one before the approach trajectories diagram, is a current status, distance to Ceres and view of Ceres against stellar background. It keeps getting updated! That hasn't happened with other images I have uploaded e.g. at other forums. Normally whatever image I put into a post stays the same. This time I must have done something different. Used the "Img" button or something. It currently gives the distance to Ceres as 277.8 thousand km. Since that post is keeping current, I'll change the headline on the thread to keep it up to date. whereupon google gives back 515 meters/second. and google gives back 67 meters/second. That is about 5800 km per day. So about 6 ceres diameters. Just checking that the conventional mass estimate gives approximately the same numbers as I got earlier. Here's another diagram of the approach, this time seen from above ceres north pole, looking down on the plane of the solar system. Ceres orbit motion is from bottom of frame to top. The probe roughly keeps up with Ceres but falls slightly behind during part of the approach. The probe enters at the left edge, 24 days before capture on 6 March, so the first day shown is 10 February. This view is from a different angle so it complements the earlier diagram--which had Ceres orbit motion into the page. It's a 90degree rotation of view angle. It shows how the gravity assist is supposed to work. Probe is just a little slow but Ceres gravity very gradually pulls it up to speed. And then it circles in. If you count the days in from the left edge (10 Feb) you will see that it is just about 2 weeks or 14 days in when Dawn stops falling behind and with help of Ceres gravity, begins to catch up. That change happens on 24 February. they had to resort to this slow gravity assist approach because the thruster was temporarily disabled in September by a cosmic ray particle which banged into the xenon flow control electronics. Several days of thrust were lost. With the new approach plan, CAPTURE happens at the same day, 6 March, but then there is a long slow loop that takes an extra month or so before the craft gets down into the survey orbit and can seriously start taking pictures. so angular size of Ceres is already 44% of that of moon. It says in the Dawn Journal (April 2014, August 2014) that the plan is to start out in an altitude 13500 km orbit and, if possible work down to altitude 375 km. I want to estimate what the angular size will be, in degrees, from the planned orbit heights. The orbit altitudes are 13500, 4400, 1740, and 375 km. so adding the average radius of around 475 km, we get the orbit radii. The two lowest orbits are designated HAMO and LAMO (high altitude mapping orbit, low altitude...). They are all polar orbits, passing over the north pole and south pole of Ceres. At the lowest orbit, Ceres will fill a lot of sky. It will be (actually over) 60 degrees wide. The arctan formula slightly underestimates the visual spread. Re: Dawn took more pictures,Ceres now 47% size of full moon. Vishnu Reddy is an astronomer at Tucson involved with processing images from space. He tweeted about the results of the picture-taking session today. You can see in the second post of this thread that the spacecraft is currently shown in an unusual orientation, with its thruster turned off. I'm guessing this represents picture-taking mode. The current status frame in the second post of this thread says the distance to Ceres is now 229.42 thousand km. That means the angular size ( arctan(.95/229.42) in deg ) of Ceres is now 47% of the moon seen from Earth. If you scroll two posts back, to the 23 January post, you see an approach trajectory diagram that starts on FEBRUARY 10 with the probe entering at the left edge of the diagram. That is about 2 weeks from today, around 14 or 15 days. I estimate at that point (10 Feb) when the real approach business with its tricky gravity assist maneuver begins in earnest, the distance to Ceres will be about 100 thousand km. The angular size of Ceres will then be 0.54 degree. Actually slightly LARGER than the full moon. That can't be too far wrong. Current status gives the present approach speed as 0.12 km/s. So that average speed would correspond to slowing down from 0.12 to 0.09 km/s over the next two weeks. in the form of a brief animation of one hour's rotation. It is similar to what we saw earlier (taken 13 Jan) but higher resolution. Re: Dawn took more pictures,Ceres now 53% size of full moon. which is 53% of size of full moon seen from Earth. this diagram is so essential I want to re-insert it. A key test comes around 24 February, at the trajectory low point. will Ceres be massive enough and Dawn close enough for gravity to stop the probe from falling behind, and bend its trajectory upwards as shown in the diagram? this is looking down on the north pole of Ceres, with the orbital motion (around 17 km/s) of both probe and Ceres in the direction from bottom to top of figure. Dawn enters at left edge (from sunward) on 10 February. The down sloping shows it falling behind, because not quite up to Ceres orbit speed---around 17 km but a bit less than Ceres. that falling behind has to stop, in order to have capture. What they are counting on is gravity assist. Ceres gravity should stop the downward slope and start to bring the spacecraft up to speed. that has to be the big February event, Dawn-wise, as I see it and a major test of the mission controllers mojo. If successful, capture occurs on 6 March, as shown in the figure. Re: Ceres now nearly 60% size of full moon. As of 30 Jan, distance to the planet is 184.47 thousand km. So its around 0.3 degrees or 60% of size of full moon in our sky. Yesterday a new issue of Dawn Journal was out. It describes a lot about the planned approach and the stops along the way to take photographs of the planet for navigation purposes. The most accurate way they have of telling exactly where the spacecraft is, is to photograph it against the background of known stars. they know the directions of the stars, so they can locate Dawn relative to Ceres by determining the background. The navigational photos of Ceres are evidently being shared with us. But that is not their primary purpose. they've reduced the frequency of taking photographs to conserve hydrazine (which is used to when you do a shoot, to first turn the ship from thrusting attitude to camera pointing at Ceres, and then from photo attitude to communication with Earth, aiming the big antenna back at us, and then to turn it back to thrusting attitude so it can resume thrusting). So its a tradeoff. Reducing some redundancy in navigation to conserve hydrazine (to use later to control attitude as they spiral down to the lower orbits and take pictures from those lower orbits, and have to transmit them back from the big antenna and so on.) A lot of attitude redirection and control will be needed later, if their luck holds and they actually achieve capture and a circular polar orbit. Here's a little itinerary and picture taking schedule from the recent 25 Jan images to 15 April. The numbers in parens are KILOMETERS: distance to Ceres and also kilometers PER PIXEL (to indicate resolution). The number between them is another measure of resolution--Ceres diameter in pixels. The percentage tells how much of the face is illuminated, whether full-Ceres, half-Ceres etc. The number before the percentage tells how much better Dawn's image is expected to be than Hubble Space Telescope's. Re: Ceres now nearly 80% size of full moon. Tx for posting these updates, Marshall. I have done some gravity assist calculations in the past and I admire the guys for the delicacy with which they maneuver the Dawn craft's orbit with the very feeble thrust of the ion engine (less than 100 millinewtons). The complicating factor is that a craft approaching a planet from 'below and behind' normally arrives at above escape speed relative to the planet. The ion thruster originally had to 'push' the craft to the higher orbit, which together with the Mars and Ceres gravity assists, eventually got it to catch up with Ceres. Then it has to scrub off ('reverse thrust' by turning around) some of that relative speed over a period of time, in order to drop it to just below escape speed, which then results in the very elongated elliptical orbit around Ceres that you have referred to earlier. I'm not sure how they will do orbit circularizing with the ion engine, but with normal 'short-play' chemical rockets it is done around the farthest orbital point (apapsis), when the relative speed is at its lowest, hence requiring the least energy per % change in successive orbits. Because of the low thrust and high efficiency of ion engines, they may perhaps thrust the ion engine at many points around the orbit. I really hope everything works just as planned! Jorrie thanks for the good comment! Helps me appreciate the orbit dynamics. When they spiral down I believe they will not thrust intermittently (e.g. only around apapsis) but more or less continuously so they stay in roughly circular orbit as they move in. The approach this time does seem tricky, because they are falling behind and still need to catch up on solar orbit speed while at the same time scrubbing off (nice terminology) excess approach speed. The original approach plan (before their September 2014 cosmic ray accident) was more straightforward. They spent several hours taking shots so there are some ANIMATIONS online which show a large part of one full 9 hour rotation. There's a choice of animations and still views on line. This one I just happened to pick is not the most spectacular. 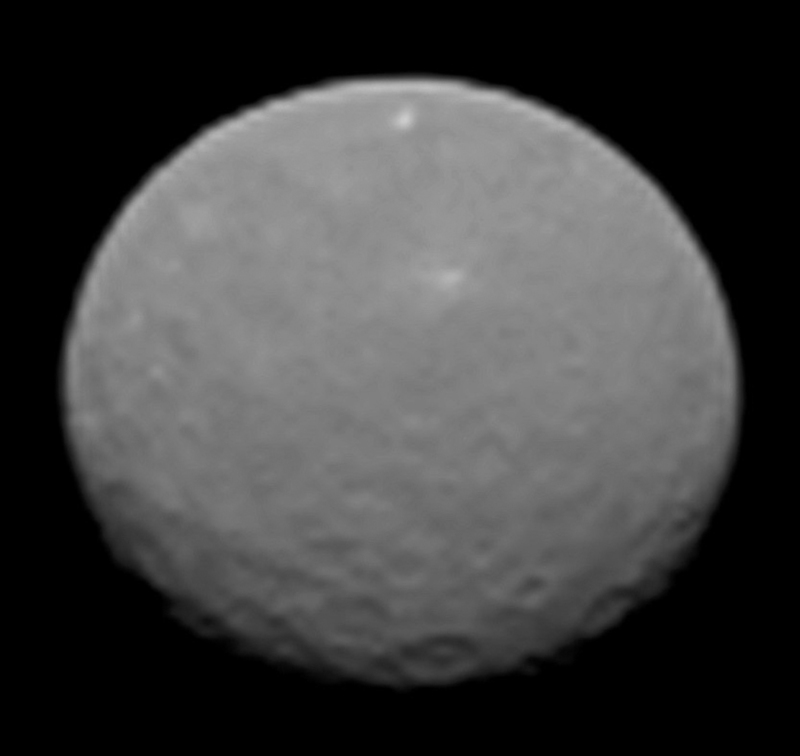 It is Ceres taken from 145 thousand km, at a resolution of 14 km per pixel. If anyone finds other stills or animations they want to add, please do, and share the links with us! Marshall » 05 Feb 2015, 20:44 wrote: When they spiral down I believe they will not thrust intermittently (e.g. only around apapsis) but more or less continuously so they stay in roughly circular orbit as they move in. You may be right, although they will need to frequently reorientate for photos and Earth communication, at which time the thrust will be off. However, during the initial circularization of the orbit, they cannot thrust everywhere. Note that I actually had it wrong in my reply above - I was thinking of the circularization of high Earth orbits, where they do it at the 'top' of an initial elliptical 'parking orbit'. By increasing the speed at the apapsis, they raise the periapsis to eventually match the apapsis. This requires the least amount of fuel for a given height circular orbit. To decrease the apapsis, one needs to decelerate at the 'bottom', which keeps the periapsis roughly the same, but lowers the apapsis. Once the orbit is nearly circular and one wants to 'spiral inwards', you need symmetrical 'reverse thrust', i.e. thrusting periods spaced more or less symmetrically around the orbit. Marc Rayman give the altitudes above Ceres surface (kilometers in parens) I have deleted his "miles" figures because too many different numbers is confusing, and I have inserted orbit radius in brackets. Orbit radius in case one wants to estimate DeltaV or the orbit periods. LAMO (850 km) where it remains. The estimated mass (based on observing near encounters with much smaller asteroids) is 943 billion billion kg. that's the way I remember it. In scientific notation 9.43 x 1020 kg. and google says 15.14 days. A friend annotated Marc Rayman's Ceres approach trajectory diagrams. In both cases the sun is off to the left. In the upper diagram Ceres orbital motion is into the page, its north pole is up. In the lower, Ceres orbit motion is from bottom to top of frame. It is as if we are looking down on Ceres north pole. the probe's trajectory is projected down onto Ceres orbit plane. Marshall » 06 Feb 2015, 21:38 wrote: In the upper diagram Ceres orbital motion is into the page, its north pole is up. Nice work from your friend! This gives one a great feeling for the 3-D orientation of the capture, but I suspect that the scales are slightly difficult in Rayman's two diagrams. I'm trying to visualize the orientation of the RC3 orbit on the bottom diagram, but have difficulty. If it is a polar view in the frame of the distant stars, I reckon that any polar orbit must be a straight line, but how oriented? Oops, no, if it is projected on the Ceres's orbital plane, it is probably not a polar view, because Ceres has some tilt in its spin axis (5 to 10 degrees, I read). In such a case the orbit should be a flat ellipse, I guess. This looks more reasonable from the bottom diagram as well. Last edited by BurtJordaan on February 7th, 2015, 8:34 am, edited 1 time in total. Re: Ceres now nearly 95% size of full moon. I like Emily Lakdawalla's comments too. If you go to her blog (at that link) and scroll down past the first two still photographs you get to this animation. I'd like to copy it here but don't know how. 2arcsin(.475/116.27) in deg = 0.468 degrees, so about 94% of full moon size. Re: Ceres now 100% size of full moon. The angular size of Ceres is the usual figure (half a degree) for how big a full moon is in Earth sky. Marshall wrote: this animation. I'd like to copy it here but don't know how. I'm just playing around. Hope you can see it. I tried and couldn't do it. Ah. I see you used TEDvid. How does that work? Does someone have to have uploaded it already to TEDvid? Can you search TEDvid even if google does not know the thing is at TEDvid? Could you put that animation into an email to a friend? Sorry about the flood of questions :^) You can tell I'm somewhat excited by the possibilities. Marshall wrote: How did you get the animation out of Emily's blog and into an SCF post. I was really just playing (nothing to lose). I'm an avid experimentalist. I went to the site you listed. Saw the animation on the right of the page, which enlarged when I clicked it. I right clicked and selected "copy image location". Then, I pasted it in the "img", "url", "flash", "googlevid", "TEDvid" and "youtube" end boxes. I clicked preview and "TEDvid" won. Edit away the losers. Re: Ceres now 105% size of full moon. I tried to imitate you (actually using a Mac laptop, no mouse to click with) and got this ridiculously small moving image instead. But at least got something! Nice thread! But we won't be able to see houses or Cereans picknicking until the probe is in LAMO at the end of the year, right? Anyway, thanks to Marshall and Faradave for some great graphics - I liked the gravity capture diagrams and the animations of Ceres. The approach and capture trajectory is more complex than the sort of thing I learned in school (which was more or less a line with a loop at the end). It's an interesting mission, any of us who follow it are going to learn. An interesting angle: when the spacecraft was launched in 2007 it was carrying only about 100 pounds of chemical propellant---45.6 kilograms to be precise. The main propulsion is solar electric, using xenon. The chemical propellant (hydrazine) is used only for directional control (orienting the craft in various directions, for taking pictures, or for sending data to Earth with the big antenna, etc...). Dawn launched in Sept. 2007 with 101 pounds (45.6 kilograms) of hydrazine. The ship escaped from Vesta in Sept. 2012, four weeks after the second reaction wheel failed during the climb out of Vesta’s gravitational hole. ... At the beginning of the long interplanetary flight to Ceres, it still had ... (32.3 kilograms) left. As it had expended less than one-third of the original supply through the end of the Vesta expedition, that might seem like plenty. But it was not. Without the reaction wheels, subsequent operations would consume much more hydrazine. Indeed, engineers determined that even if they still had the entire amount that had been onboard at launch, it would not be enough. The Ceres objectives were at serious risk! The flight team undertook an aggressive campaign to conserve hydrazine. They conceived more than 50 new candidate techniques for reducing hydrazine consumption in the 27-month journey to Ceres and the 18 months of Ceres operations, and systematically but quickly assessed every one of them. Dawn’s two years and four months of interplanetary cruise concluded on Dec. 26, 2014, when the approach phase began. Although the team had computed that they might squeeze the consumption down to as low as 9.7 pounds (4.4 kilograms), it’s one thing to predict it and it’s another to achieve it. Changes to plans become necessary, and not every detail can be foreseen. As recounted in October, the trip was not entirely free of problems, as a burst of cosmic radiation interrupted the smooth operations. Now that the cruise phase is complete, we can measure how well it really went. Dawn used 9.7 pounds (4.4 kilograms), exactly as predicted in 2012. Re: Ceres now 126% size of full moon.